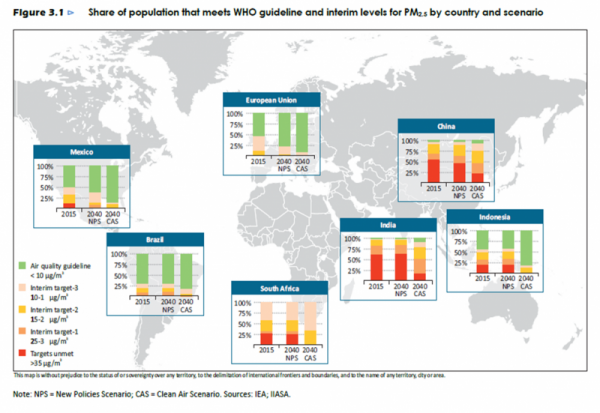 The International Energy Agency, a respected source of data and insights into energy markets and technologies, has published a report – Energy and Air Pollution – on how the energy sector affects air quality and public health. As the report explains, “[o]ur energy system contributes vitally to economic and social progress around the world. 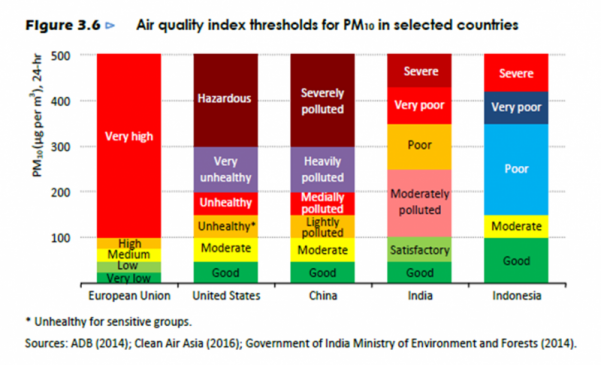 But there are costly side-effects.” The report marks an important development for the IEA: this is the first time the IEA has conducted a major study on the role energy plays in air pollution. The report is the latest example of a growing recognition that sound energy policy cannot not be indifferent to public health, and that an integration of energy and environmental policy goals can lead to more socially cost-effective economic development. The three charts below the jump illustrate how the report integrates data and policy information for international comparison. Figure 3.1 shows wide variations in ambient air quality, as measured against World Health Organization standards. 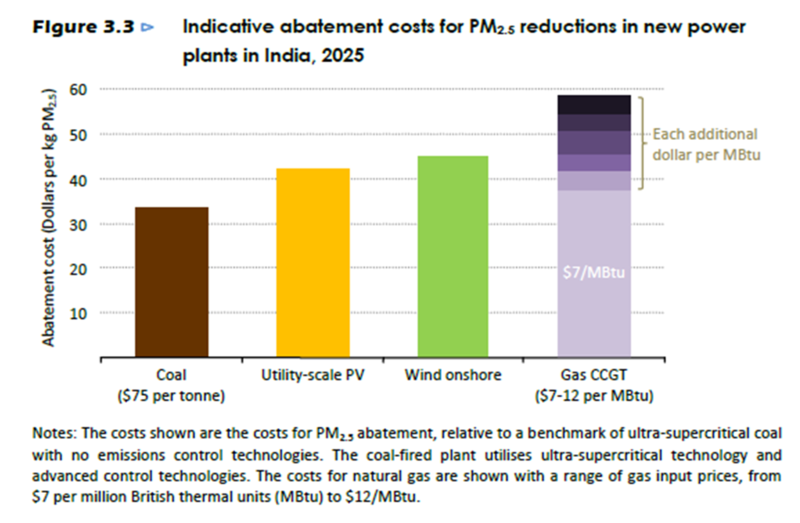 Figure 3.3 compares the cost-effectiveness of different sources of electricity generation for the purpose of abating PM2.5 emissions from new power plants in India. Note that the coal-fired plant in the comparison is an ultra-supercritical plant using no additional pollution control technologies. Most coal plants being planned or built in India burn less hot, and so emit more PM than an ultra-supercritical plant. Figure 3.6 shows that air quality standards for PM10 are less and less stringent as one goes from the European Union to the U.S., to China, to India, and finally to Indonesia. What is considered unhealthy in the former countries is only moderate in the latter. Living in Karachi,with one of the highest PM2.5 levels and rising. No one understands the seriousness of the situation. Those who can help, please explain to the people and Govt. that there is no greater threat to their lives. I’ve tried with the newspapers. They just publish articles from abroad but do not publish my comments. I have just recovered from acute bronchitis and have family who are affected and don’t have solutions.